It seems as though there are a gazillion different lines on the market for us to choose from. Braids, monofilaments, fluorocarbons, pre-stretched, Dacron, string,…..the list goes on, and then there are all the different brands and thicknesses and colours…if only there were a reasonably priced, hard-wearing line that isn’t meddled with or rebranded every spring. 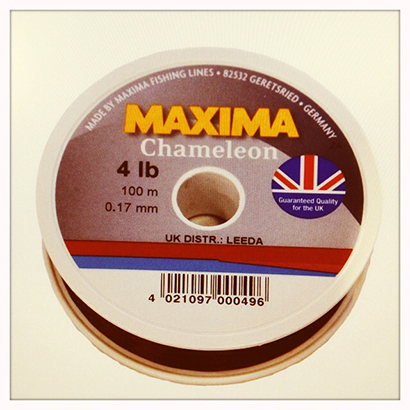 Maxima have been making fishing lines for over 60 years, and the Chameleon range is wonderfully versatile. Designed to change colour to match the water, Chameleon’s greatest quality is its durability. It has little memory and can take a battering, surviving scrapes with ricks, twigs, brambles and even pike. It might not be the thinnest line on the market, but the 4lb breaking strain can stop a train and a jumbo spool of 10lb b/s could probably reel in the Moon….